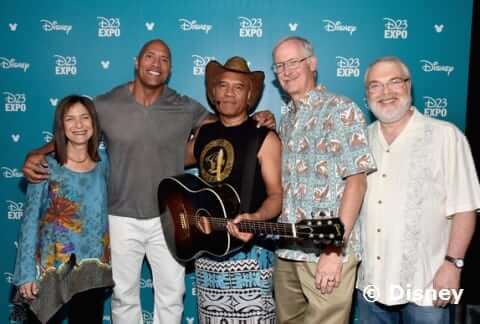 INTERVIEW: Songwriter Opetaia Foa'i discusses his collaboration with Lin-Manuel Miranda on the music of "Moana"
Opetaia Foa'i (center) performs a song from "Moana" at D23 Expo 2015. In part 6 of our in-depth interviews with the creative team behind Walt Disney Animation’s latest animated feature “Moana”, I talk with songwriter Opetaia Foa’i about crafting the songs for the movie, bringing his culture into the music, and working alongside Lin-Manuel Miranda. ITM: How did you and the other songwriters come to be involved with ‘Moana’? Opetaia Foa’i: Our manager got a call to ask if I could write [songs] for the movie. [Original score composer] Mark Mancina was already in, and then they brought me in. And then it was only about three or four months later that they got [co-songwriter] Lin [-Manuel Miranda] in. 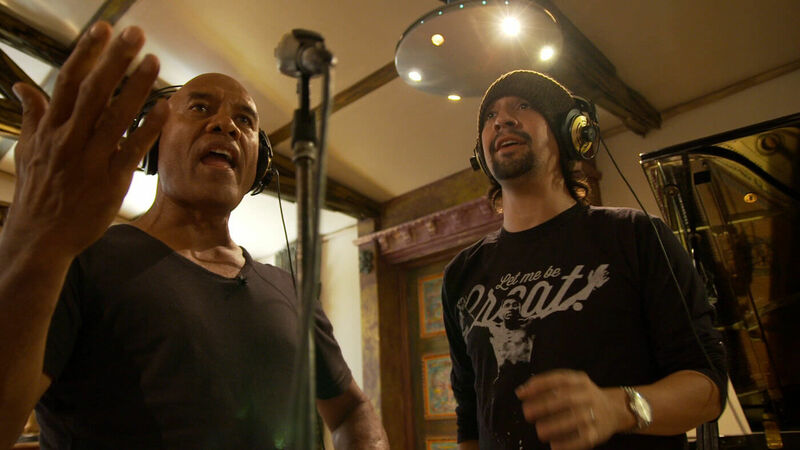 ITM: What was it like working with Lin-Manuel Miranda? Foa’i: I met him for the first time when he came to New Zealand. That’s when they were immersing themselves in my culture in the area, and I was impressed [by] the way he jumped onstage and danced. 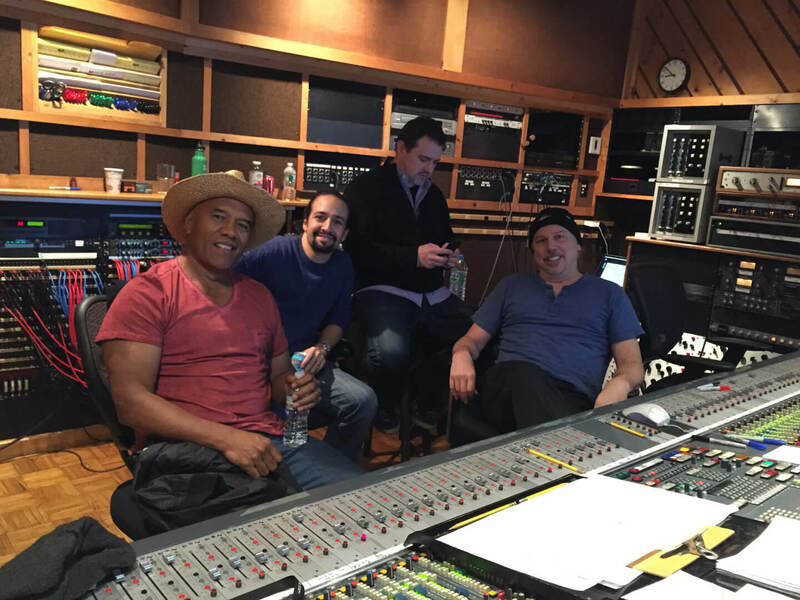 When we got into the studio, we discovered that we worked pretty well together. He’s very quick, and I’m very quick at capturing the emotions of pieces, so we found it was a lot of fun in the studio. ITM: Tell us a little bit about your background and your history with music. Foa’i: I was born in a village in Samoa. This is in a hut, a grass hut. No walls. You can see it in geographical [films], but that’s where I was born. That’s my upbringing. So I’m coming from a village to [a] huge city. When I was growing up, the traditional music of Samoa was everywhere, and I just soaked it in, loved it. Still love it. And so as my journey comes through to the big cities, I pick up on Jimi Hendrix, Peter Gabriel, you know? So you mash them all up and that’s what [goes] in, and what comes out is [my music]. But for this movie, my role was to bring out more of the culture that was within me. ITM: Did you have any exposure to or knowledge of Disney films as a child? Foa’i: I didn’t really know much about [Disney] when I was growing up, because [it was] a very poor village, so we don’t get a chance to see any of that. So it was really my children growing up, when I was in my late-twenties, thirties, and they liked ‘[The] Lion King’ and then liked this and that, so I got into that [then]. ITM: Now that you’ve become part of the Disney family, have you had a chance to visit the parks? ITM: What was your approach to the tone of the music in ‘Moana’? Foa’i: I think it had to be in line with the culture itself, so I brought that side strongly to the table and Lin brought, apart from the lyrics, the other elements that come with him. And then you’ve got Mark Mancina, who can recognize bits that worked for Disney. That’s how it worked. ITM: How would you describe the feel of the music? ITM: From your perspective, what do you think the theme of ‘Moana’ is? ITM: Is the concept of ‘girl power’ a rare thing where you come from? Foa’i: One of the languages in the movie is Tokelauan, and in the Tokelau society, the eldest girl of the family is chosen, [and] runs the whole family. All the boys, whenever they’re going to do something, they tell her, and she instructs. With any argument, she smooths it out. Everything she does is for the good of the family. My father comes from Tokelau, so I [was] brought up around that. Even our family now, we have one sister. She tells [the boys] what to do all the time. [laughs] But it’s all for the good of the family. So we do have cultures that do value the role of a girl [or] woman. ITM: Now that you’ve seen the finished movie, are you proud of the way your culture in represented in ‘Moana’? Foa’i: It’s like speaking to somebody without words. You feel something, you know? And this movie has got a lot of that. There’s a lot of what we call mana, which is sort of like a spiritual aspect, in this movie. And it doesn’t matter what culture you come from, you can identify with those things. And I think this movie, when people see it, there’s lots of little truths that people can latch onto, [that connect] with their own lives. So for me, the culture is represented very well, and if I can see people walk out with huge smiles on their faces, I think we’ve done a good job. “Moana” opens in theaters nationwide today, November 23rd. VIDEO: The LEGO Disney ‘Frozen Northern Lights’ trailer has arrived! I want to give you a huge round of aplause because today you have raised you voice for the peace of humanity, am em sure about that. Out of all the blogs on this website I thought yours to be the most interesting. Older Older post: VIDEO: The LEGO Disney ‘Frozen Northern Lights’ trailer has arrived!